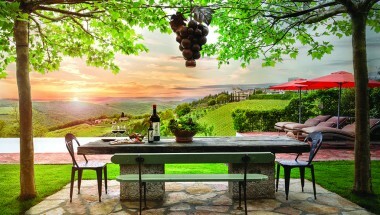 Villa le Sorelle is an enchanting holiday villa to rent, with romantic Tuscan ‘shabby chic’ overtones. It is situated at the bottom of the small Renaissance hill town of Pienza in the Val d’Orcia, between the towns of Montepulciano and Montalcino. It has recently been meticulously restored by the owners, retaining traditional features, and also adding reclaimed period ceiling beams, doors, bricks for the floors and old oak floor boards. The result is a beautiful and authentic old farmhouse, with all the modern amenities for a relaxing and comfortable holiday. Outside, there are several furnished patios for relaxing and enjoying an al fresco lunch or dinner outdoors, as well as the wonderful views. There is also a salt water lap pool (18 x 4m), surrounded by local stones, agapanthus, lavender and white roses. The pool can also be heated on request (payable extra). The accommodation is in two wings, including six bedrooms and six bathrooms, two living rooms, a dining area, a main kitchen and two service kitchens. Amenities include air conditioning, heating, window screens, Hi-Fi, satellite TV, DVD player and Wi-Fi internet. Massages (shiatsu or ayrveda) and yoga instruction can be arranged in the yoga/massage studio just 100m from the villa, or in the garden of the villa. 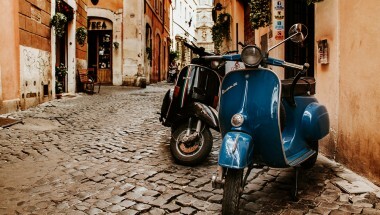 On request the owners are also happy to arrange the services of a cook, a Michelin chef, cookery lessons, a personal trainer and Italian language courses, as well as recommendations for excursions, and wine and cheese tastings during your stay. Spacious living room with large fireplace with very comfortable sofas. Small kitchen for preparing snacks. Staff bedroom with en-suite bathroom. Double bedroom with king-size bed. In the corner of this bedroom behind a silk screen, there is a huge round 170x170 Villeroy &amp; Boch tub with hydromassage. There is also a private bathroom with a shower. Double bedroom with en-suite bathroom with double shower and double wash basins. 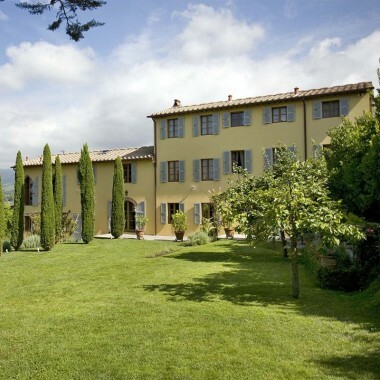 Between these two bedrooms, there is a room with a small table and two 18th century armchairs, opening to south-facing terrace with a spectacular view of Monte Amiata, ideal for relaxing in the evening with a glass of wine! Entrance through large wooden arched glass doors to a huge double volume room with ceilings 6.50 m. high. Romantic round stairs lead to a mezzanine with a French bed. On the ground level is a large antique wood dining table, seating 12, providing a lovely area for lunch or dinner when it is very hot outside, or raining. The Tuscan-style kitchen here is very well equipped (4 burner gas stove, oven, large refrigerator, dishwasher, microwave). The kitchen opens to a large patio. There is also a double bedroom with an en-suite bathroom (bath with hydromassage). Here there is the main living room with a big fireplace and furnished comfortably. Through an arched doorway, there is a small kitchen which is a service kitchen for guests staying in this part of the villa. Also off the living room is a charming double bedroom, with en-suite bathroom with shower. Double bedoom with king-size bed, and en-suite bathroom with double shower. Maid service on Wednesdays, with change of linen also included every Saturday. Welcome dinner prepared by ‘Tuscan mama’ (cost of ingredients extra). The very helpful owners will also arrange other services for guests, and recommend restaurants. 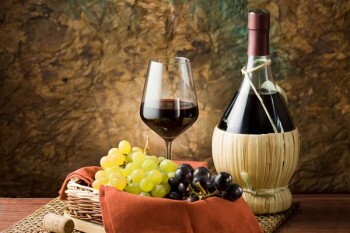 Other possible services include: Wine tasting in various wineries in Montalcino or Montepulciano. Cheese tasting (Pecorino) in Pienza. Private ‘Tuscan mama’ chef at the villa. Cooking classes. Small events, including weddings and birthdays. 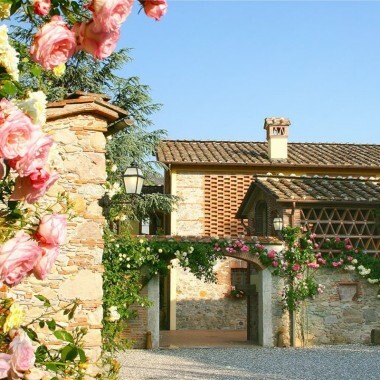 This enchanting holiday villa to rent, is situated at the bottom of the small Renaissance hill town of Pienza in the Val d’Orcia, between the towns of Montepulciano and Montalcino. 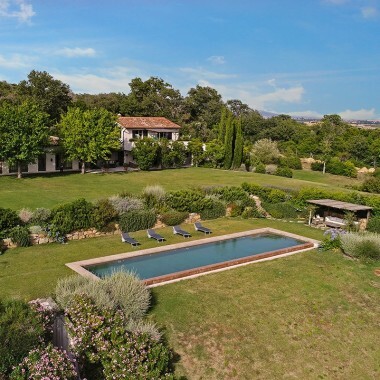 As well as a salt water lap pool, many extras can be arranged at this property, including massages, a chef, cookery lessons and wine and cheese tastings.